Coming into 2014, I must admit that I wasn't very excited with Marvel's schedule. After the pretty good, but definitely "yup, we're going to do Dark Elves and crap like that" nerd-out that was Thor: The Dark World, it seemed like we were in for a year of Marvel spending testing how far a mainstream audience would follow them. Mostly by that I mean Guardians of the Galaxy, which I'll be getting to soon, but I wasn't particularly interested in Captain America: The Winter Soldier either. It had less to do with the premise - which was a pretty good arc in the comic - but more that I just didn't like Captain America: The First Avenger. I still don't, really: it's an assemblage of scenes without any clear narrative structure or, to be honest, stakes, designed to tell Steve Rogers (Chris Evans)'s origin story, introduce the Red Skull and the Tesseract, and then freeze Cap so he can be in The Avengers. It is not, however, a movie that I found to be worth watching again, and I tried. Accordingly, I had very little enthusiasm for The Winter Soldier, despite the presence of different directors (Joe and Anthony Russo instead of Joe Johnston) and a focus more on Cap's role in S.H.I.E.L.D. * over trying to sell the "shared universe." That is, to say, more like Iron Man 3, which everyone seems to hate but me, in part because I knew it was a Shane Black movie. Still, I didn't really have any reason to assume that the brothers Russo, veterans of Arrested Development and Community, were any better equipped to make a Captain America movie than the director of The Rocketeer. I also didn't know what kind of Captain America movie they were making - that it would be heavily influenced by 1970s paranoia thrillers, mixed with modern action films, but with slightly more coherent editing. Had I known that, I might have still been suspicious of the directors' background in comedy, but it would have assuaged any lingering concerns that The Winter Soldier would be anything like The First Avenger. In fact, The Winter Soldier isn't even anything like The Avengers, which worked Cap into the fold, but sometimes in uncomfortable, ham fisted ways. We're not talking Hawkeye levels of "why are you in this? ", mind you, but if you look at the team dynamic, Steve Rogers has very little impact until late in the film, and even then it's mostly Iron Man's show. 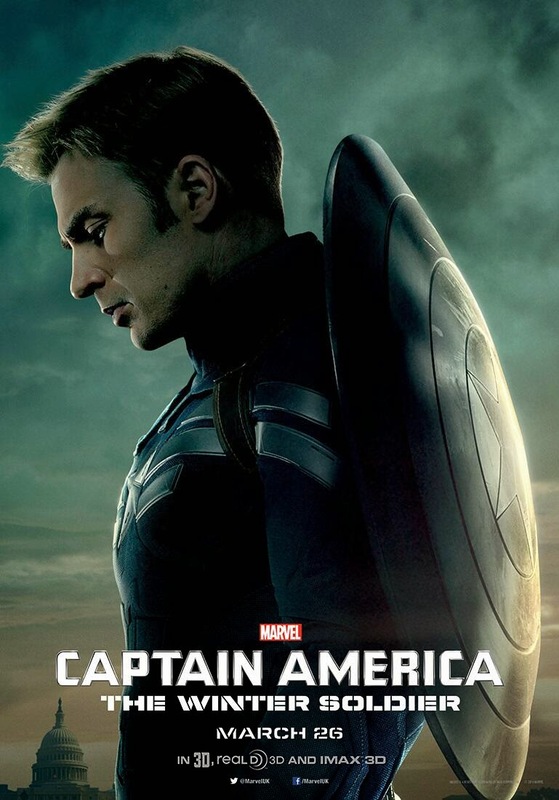 The Winter Soldier, despite the increased presence of Black Widow (Scarlett Johansson) and Nick Fury (Samuel L. Jackson), is mostly Steve Rogers' show. It's less a film about him adjusting to the present than putting Captain America's "good old fashioned American values" against the modern surveillance / defense landscape. More importantly, it's not necessarily clear that either side is totally right or totally wrong. Fury finds himself the target of an assassination, Cap and Black Widow end up on the run, and the head of S.H.I.E.L.D., Alexander Pierce (Robert Redford) has to make a decision about the organization's future. To say much more would spoil the movie, and by proxy, the end of the first season of Agents of S.H.I.E.L.D., and on the off chance you're the one person reading this who hasn't been prepping for The Avengers: Age of Ultron, I'll let you be surprised. If there's any character who gets the short shrift in The Winter Soldier, it's the titular character, who is limited to a "Darth Maul" level of screen time for much of the film. When he's onscreen - and for SPOILER purposes, I won't identify the actor - The Winter Soldier's impact on the story is felt, but his overall arc feels more like the beginning to a larger story. That said, he's part of several crackerjack action sequences, handled with aplomb by the Russo brothers. Both are essentially chase sequences: one with Fury, and the other involving Cap, Black Widow, and the man who will become Falcon (Anthony Mackie). Aside from John Wick, they may be my favorite sustained action sequences in a film this year, and I was not expecting that from Marvel. Not only are they well choreographed, but the Nick Fury chase scene is as suspenseful as anything I've seen in a while. I noticed that The Winter Soldier has a slight shift in the way that Cap / Steve Rogers is portrayed: Chris Evans adds more nuance to the "good guy" type from The First Avenger and The Avengers. He's trying to fit into the world now, and not just in a way that generate anachronism laughs. The Winter Soldier is frequently funny without relying on "Rip Van Winkle" jokes - although his notebook of pop culture to catch up on is amusing in its own right. The film also bridges the first and second film by having a few returning characters, mostly presented in logical ways. It's a bit sad to see an elderly Peggy Carter (Hayley Atwell) suffering from Alzheimer's, even if we also meet her granddaughter (Emily VanCamp). Technically that might be a SPOILER, since the film doesn't necessarily address it yet, but instead lays the groundwork for her character as an Agent of S.H.I.E.L.D. in a few critical junctures of the story. The most surprising cameo has the potential to be the dumbest, as it is the equivalent of the "Bond villain explains his plan" moment in the film, but the audacity behind it makes the scene work. In fact, it's hard to think of a moment that doesn't work in the film, other than maybe the Big Dumb Climax. Like Guardians of the Galaxy, and Thor: The Dark World, and Iron Man 3, and The Avengers, and I would argue, even The First Avenger, The Winter Soldier ends with Cap and Falcon trying to bring down three flying weapons of mass destruction before they, well, destroy everything. How you feel about this apparent strategy to end every Marvel film the same way is going to depend on your mileage for this overused finale. It's not any better or worse than the others, and its impact will be felt on the larger Marvel universe in movies we haven't gotten to yet (Ant-Man, how do you feel about the collapse of, uh, SPOILER nevermind). It does seem silly to use this as the backdrop for a moment between Captain America and The Winter Soldier, as the film does end on a series of quieter moments, but maybe the blockbuster comic book movie demands it. I mean, Days of Future Past isn't a lot different, what with its "dropping a stadium around The White House", and while I didn't see The Amazing Spider-Man 2, I sure heard about its Big Dumb Ending. * As a side note, it's probably worth mentioning that I had been so underwhelmed by Agents of S.H.I.E.L.D. after the first few episodes that I stopped watching, and didn't finish the first season until after The Winter Soldier came out. The back half of the first season is considerably better than the first six or seven episodes.